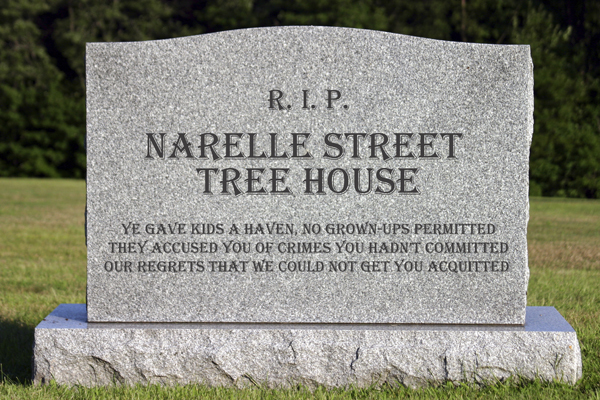 We are gathered here today to mourn the premature passing of Narelle Street tree house in North Bondi, Australia. For eight precious years, the tree house offered children their own leafy haven, refusing entrance to grown-ups “at any time.” On its well-worn wooden platform, children shared secrets, explored the natural world, and delegated responsibilities as kings and queens of the forest. The Waverly Council deemed the Narelle Street tree house a danger to children, not because it had hurt anyone, but because it failed to meet “council standards.” Parents in the community heroically stepped up to rescue it from imminent demolition. Alas, their efforts were in vain. The tree house fell victim to the over-regulation and worst-first thinking that has plagued so many other play structures before it. It met its early demise in the name of children’s safety, and yet we must ask ourselves if its absence will only hurt children more. Friends and fellow play advocates, please join us in paying tribute to the beloved Narelle Street Tree House as we grieve its premature passing. Top photo courtesy of Save Narelle Street Tree House. Get the full story from the Sydney Morning Herald. Pay your respects at our other virtual funerals.